If you’re searching for some laughs to squelch the winter blues, look no further than the Delray Beach Playhouse. The venerable theater company has assembled an exceptional ensemble of actors to present Neil Simon’s California Suite, a quartet of playlets set in Suite 203-204 of the Beverly Hills Hotel. The show is regularly filling nearly every seat of the revamped performance hall. A cast of DBP regulars and newcomers puts their all into this show written in the 1970s, and updated a bit by director Randolph DelLago to accommodate modern audiences. So don’t be surprised to see a profusion of cellphones and hear references to folks like Lady Gaga and Ron Howard as a director, not as Opie Taylor or Richie Cunningham. California Suite is easily one of the funniest shows DBP has ever staged. And while the audience doesn’t roll in the aisles, several cast members actually do end up on the floor in staged combat, giving vent to their Simon-generated antagonism. 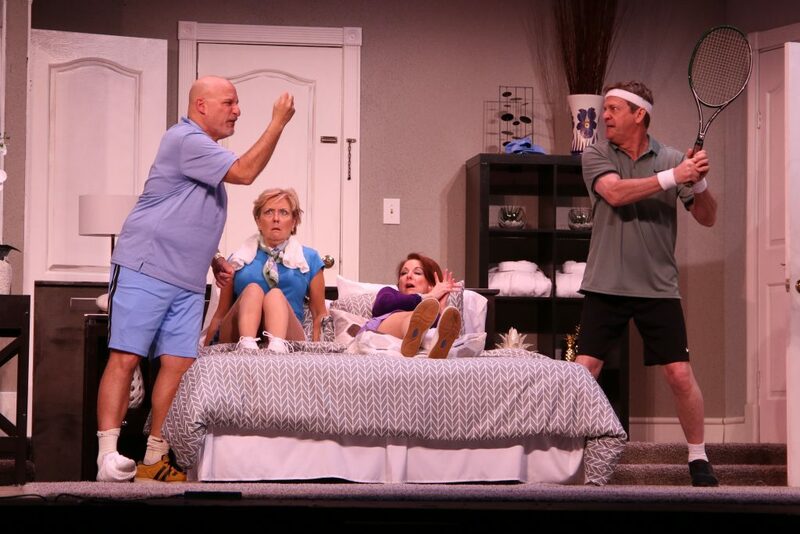 Perhaps the funniest and most physical set involves two couples from Chicago vacationing together. Their entrance is an explosive one as Mort Hollander (Harry Redlich) helps his injured wife Beth (Pat Casale) into the suite. Beth has twisted her ankle while playing tennis with their friends and traveling buddies, Stu and Gert Franklyn (two DBP veterans, Michael DeGrotta and Marcie Hall). Mort’s anger toward the Franklyns, whom he blames for the tennis mishap, is as potent as Beth’s physical pain. Long-simmering tensions between both couples volcanoes as the characters scramble to aid Beth. While trying to help her, they suffer a domino-effect series of injuries – including a floor fight and a demand by Stu that Mort should stick a can of tennis balls where the sun don’t shine. Seeing respectable actors rolling on the floor makes it impossible not to laugh. In another playlet, Redlich gives an over-the-top, top-notch performance as Marvin Michaels, a hungover man who is desperately trying to wake a prostitute (Melissa Baird) who has passed out in his bed, before his wife, who arrives at the hotel a day early, discovers the situation. Barbara Feldman elicits a multitude of laughs as Millie Michaels, who takes severe offence at her husband’s misbehavior. Her volatile tongue-lashing of Marv, and her New York accent that drips with sarcasm, pleases the audience immensely. The two actors’ chemistry as a long-married couple is perhaps the best pairing onstage. The situation involving two visitors from London, in town for the Academy Awards, is more thought-provoking than outwardly comic. Sidney and Diana Nichols (Redlich and Hall), a glamorous couple, are getting ready for the Oscars, where Diana is nominated for the Best Actress award. Frazzled and insecure, she spends a lot of time complaining about her dress and her hair, but one wonders if there is more to her self-esteem issues. Simon hints at the possibility that Sidney may be gay or bisexual, and their marriage may actually be a façade. Ever the optimist, Simon closes the scene on a high note, which seems to resolve the issue. 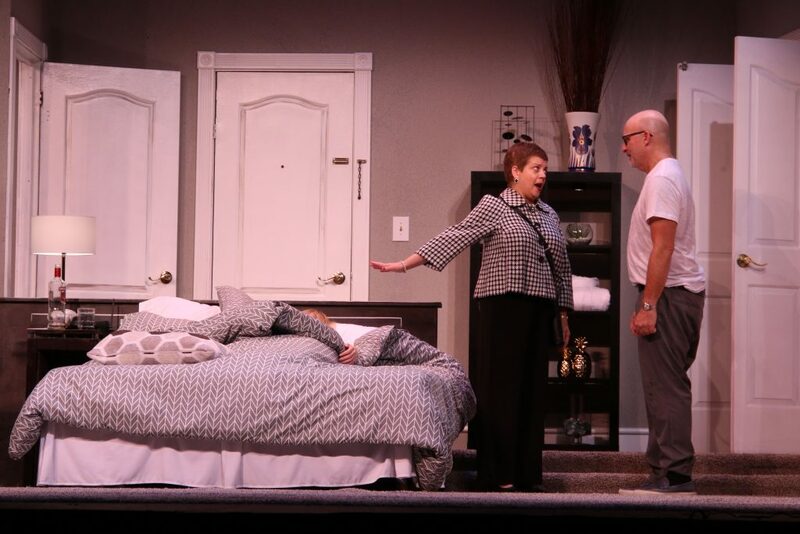 The scene with Hannah and William Warren (Casale and DeGrotta) as a long-divorced couple fighting over their daughter’s living arrangements is interesting, but inconclusive. Haughty, snide and intimidating Hannah presents herself as a force to be reckoned with, but William seems utterly unconcerned about her bluster, having long ago cut that cord. The scene is a tad long and wordy for what ends up with a fairly simple decision. Every actor shows he or she is worth his or her salt. This is no easy play to produce or perform in, with cast members switching roles – and personalities. The stage crew also deserves a serious thumbs-up. The grand-scale set is expertly constructed and detailed, showing the impressive interior of a typical high-end hotel suite. Costume designer Sarah Crew dresses the characters to suit their personalities and situations, ranging from formal ball gowns to tennis shorts. And the scene changers – Bianca Beche, Kaylee Cooper, Dominic Geragi and Mikayla Perry – make altering the stage in darkness seem easy. They even got a bit of applause. California Suite plays through Feb.17 at the Delray Beach Playhouse, 950 NW 9th St. (Lake Shore Drive), Delray Beach. All tickets are $30 and may be purchased online at delraybeachplayhouse.com or by calling 561-272-1281.